The quotidian showers that have been occurring in the interiors of the southern peninsula are likely to remain unhindered as the interiors are likely to witness yet another stormy evening. Thunderstorms could form in western Tamil Nadu, southern Karnataka and adjoining Andhra Pradesh by evening and sustain till night following a sizzling afternoon. Thunderstorm associated rainfall and squalls are likely in parts of eastern India like West Bengal, Odisha and the north-eastern regions adjacent to Bangladesh. 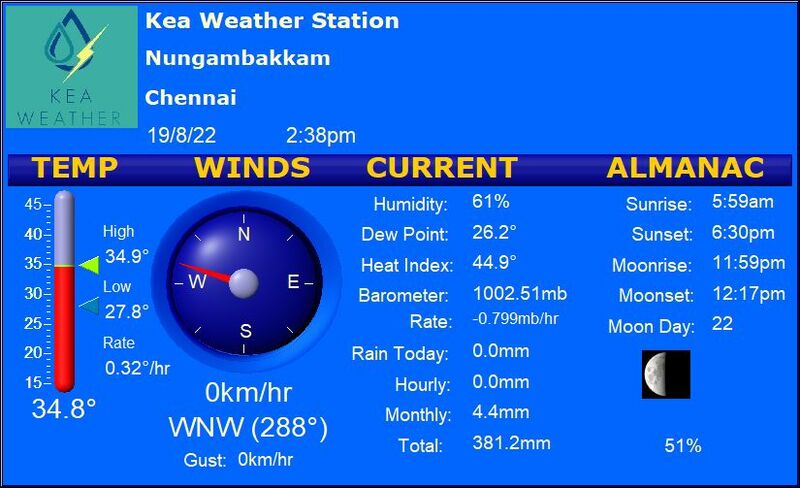 Chennai – Hot and humid day ahead with the temperature peaking at 35-36 C.
Trichy – Balmy afternoon on the cards with the mercury hitting 41 C. Rainfall possible in the district. Madurai – Blistering heat up ahead as the temperature could hit 41-42 C in the afternoon. Thunderstorms likely close to the district. Coimbatore – Yet another uncomfortable day ahead with the temperature crossing 37-38 C. Slight chances of rainfall exist. Vellore – One more super hot day to add to the streak as the temperature could hit 42-43 C. Thundershowers possible in the western parts of the district.